Hybrid animals are something that we typically only dream about. Most of them are mythical creatures from story books from our childhood. But a few of them turn out to be real. Take for example ligers. They are a hybrid between a tiger and a lion. But that isn’t the only hybrid animal that happens to be real. 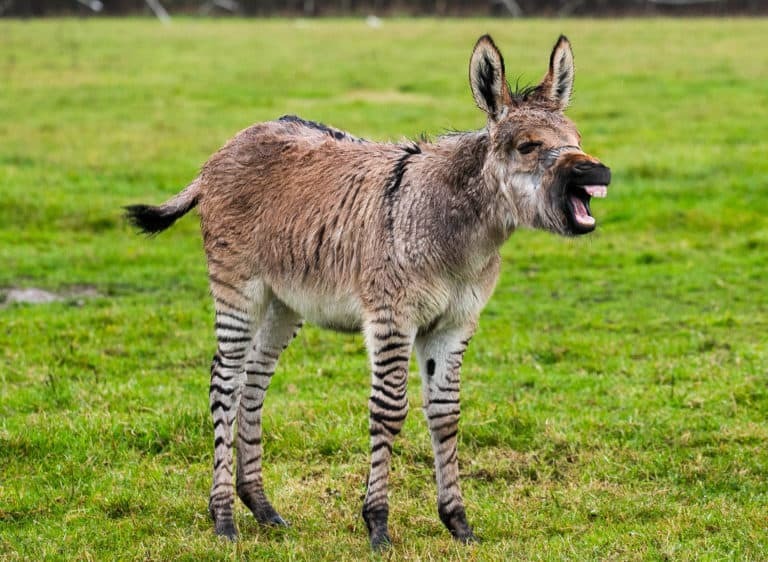 Great Britain now has what is believed to be the second zonkey in the country. That’s right, a hybrid breed between a zebra and a donkey. This hybrid actually happened naturally. The baby was born October 2 in South Barrow, Somerset in England. The baby is the latest addition to Kristine Turner’s farm. She bought Ziggy, the baby donkey’s zebra mother, for £10,000 ($13,065) in 2009 and she has stayed in a pasture with nine donkeys since. Kristine says she had always hoped it would happen, but it never seemed to, so she finally just gave up. By surprise, Ziggy finally bred with Rag, a four-year-old donkey, without her even knowing. Ziggy has always been a bit pudgy, so Kristine didn’t even notice when Ziggy began getting a bit larger from carrying a baby. Then one day she looked out her window and was shocked. Peeking up over the grass was what appeared to be a foal. Kristine says she ran downstairs in her pajamas, put on a coat, and ran out to the pasture. Sure enough, there lay a healthy baby zonkey. She named the baby Zippy, and she says she believes he is one of only two zonkeys in Britain. The other is named Zambi and lives on a donkey sanctuary in Shropshire. Ziggy is a very protective mother who never leaves her baby’s side. Kristine believes that Zippy is an appropriate name for the busy baby boy. She says that she has to remember that Zippy is still part wild animal and he likes to nip and kick at her from time to time. She has finally gotten to where she can brush him a little bit at a time. So if you’ve ever wondered what a zonkey would look like, now you know! Kristine says Zippy is quite a miracle and she’s glad to have him on the farm. Be sure to share this story with your family and friends so they can see what this adorable little miracle looks like.